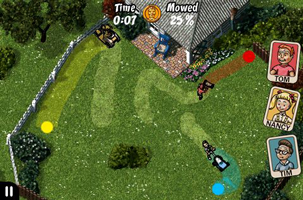 A cutting-edge lawn mowing game for the iPhone and iPod Touch. A game that challenges your multitasking abilities and mowing skills. Mow against the clock with the TNT Kids; Tom, Nancy and Tim in a stunning visual setting. 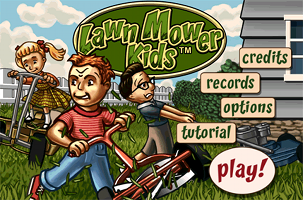 Welcome to LawnMowerKids, the game that challenges your multitasking abilities and mowing skills. Lawn mowing is normally a peaceful job, but not this time. The gardens are full of fun and exciting obstacles. It is easy to start mowing. Just touch and drag the kids where you want them to mow. Fire up the different mower types to work out the best strategies and tricks for each new lawn. Find the best way to clear the lawn avoiding hedges and flower settings, without upsetting neighbours or household pets that may attack. Collect Mr. Mowman's coveted medals by beating set times for each level. Get at least bronze medal status on all weekly levels to unlock the next week of challenging fun. 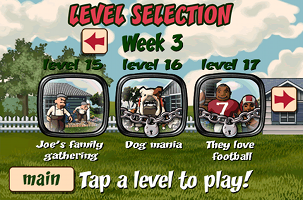 Complete the near impossible higher level lawns to finish the game and win the big Mr. Mowman Trophy! Torque by instant action is the licensed engine middleware that Lawn Mower Kids is based on. The Dohi Sweden Game Studio is using an in-house developed modified version of Torque to bring its content alive on various platforms usch as iPhone, iPod Touch, iPad, Mac and PC. iPhone, iPod Touch adopted gameplay. 21 true-to-the 50ies levels to unlock. 20 game animations of friends and foes. 3 Mowers - standard, motor, vehicle. Original Soundtrack and lots of humor! Increasing difficulty - increasing pace. If you like to stay updated with all our latest news please join one of our channels below. © Dohi Entertainment All right reserved.